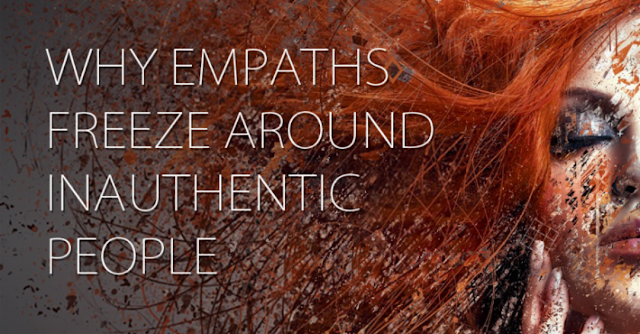 Empath by meaning is an emotionally sensitive person who sponges up the emotions of others. Sounds like a tough job right? Well-being around a fake person for an empath is close to excruciating. Have you ever spent time with a person who on the surface seems extremely nice, but when you are around them you feel awful and struggle to form a sentence? Hypothetically speaking this is caused by your empathetic antenna sensing that something is not as it seems. You are detecting that what is being shown is a fake persona created to hide something from others. When an empath comes across fake people it is very common for them to shut down as a form of self-protection. This can be seen as stumbling over words or one’s memory and overall thought process being affected. Anyone not emanating truthful vibes will put an empath on high alert. We have all met fake people, and they are easy to spot. Here are a few personality traits and behaviours that could leave you feeling awful if you are an empath. Someone who has a need to be loved by everyone they meet, acting overly nice to get adoration. Someone who makes up stories to make themselves seem interesting. Someone with an emotionally destructive childhood leaving them insecure and in pain, yet playing the tough guy. Someone filled with hate or anger who works overly hard to convince the world otherwise. Having a feeling of helplessness. Avoiding being in their presence, yet not really having a reason to do so. Having an overwhelming sense of dread. But, with all that being said; just because you are an empath does not mean you do not fake yourself. When an empath feels bad around a faker it could mean that they are picking up a trait they do not like about themselves. Everyone has to put on a fake face at some point in their life, but for some, it comes as an everyday thing. One of the biggest causes of unhappiness is not knowing yourself and when we hide a side of us from others without knowing the reason, it causes us pain. Being your true and authentic self is emotionally freeing! Sensitive people are more likely to bury negative traits because of how self-destructing they can be, but it is important to remember that burying an issue does not get rid of it and they will always uncover themselves and cause damage.